We’re coming up to the end of the year. I can count down on one hand now how many NSO concerts there are left, only three after this before the end of the season, which is sad, but it’s exciting because it means the new season will be announced and there’s a whole new year of concerts to look forward to. I’m dying to see what’s on the new program for the year and what we will be enjoying come autumn. In any case, I bought this ticket a year ago, almost, and it’s finally here. I was (and still sort of am) quite unfamiliar with Jörg Widmann as a name, but he’s apparently kind of a big deal. For one, they were all German or Austrian composers. Second, the four pieces represented independent eras of music history (latest classical or earliest Romantic, Classical, 21st century, then 2oth century), which was cool. 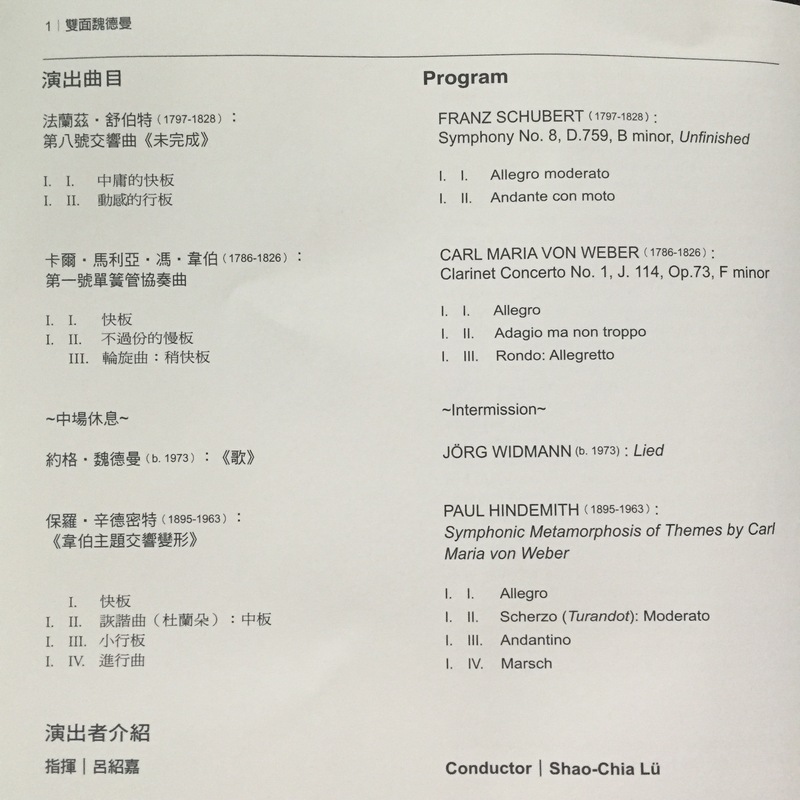 Lastly, there was a concerto on the program, which is always (usually, depending on the work) a good show even for a newbie. The concert gets underway and I was most excited about the first and last pieces, to be honest, but only because I know them the best. Schubert’s two big movements, celebrated incomplete though they are, sound proto-Brucknerian, rich, big, and darker, more ominous than his bright but still melancholy epic ninth. These left my guest very impressed, and I was pleased to have heard the first two movements of what surely was to be an epic symphony carved out of empty space in pristine detail. Next was Widmann giving us Weber. I (having never heard this work live or otherwise) expected it to be much more subdued, properly Classical, elegant and smooth. It was colorful and Classical but also wildly lively, extremely virtuosic, and at times explosively energetic. It opens darkly (it is in a minor key), but opens up to a playful, exuberant energy with the clarinet all over the place. Widmann either has the lungs of a Tibetan yak or is an extremely secretive breather, because he seemed to play extremely long lines without gasping for air. He literally jumped and swayed and danced around, facing the orchestra, at times seemingly restraining himself from conducting just out of pure joy. He twirled and jumped and gestured, bell up, bell down, as if he were writing the music in the air with the end of his horn. Spectacular playing, but I got the impression at times that Weber had included so many notes in some of his lines that the whole thing seemed the slightest bit muddled. In any case, phenomenal to see and hear live. No encores. After the break, when the audience saw Widmann escorted to two empty seats, joined by his usher/friend/acquaintance, the much larger orchestra appeared to give us his Lied, composed in 2003 and since revised. The program notes for it were quite interesting, like it was a meditation on Austrian (or German) music in general, an adaptation of the song tradition for orchestra, with apparent hints at Schubert and Mahler, but sounding much more like a 21st century Mahler 10. It was interesting for sure, and I get the idea of it, but it was more something to observe in the concert hall and wonder at than to listen to on your own time (at least for me). The piece was unsurprisingly über-modern, but gained a roar of applause, shouts of bravo, and even some standing audience members (a rarity here). I was interested to ask those passionate patrons what about the piece excited them so, not be incredulous but just to know what other people thought specifically of it. The final piece on the program was Hindemith’s Symphonic Metamorphosis, a truly wonderful piece. I recall having heard it performed here before but now can’t recall by whom. In any case, the ensemble for tonight seemed much beefier than the previous concert I’d attended, and overall it was a great performance (despite some potential fatigue). There’s so much detail in this work that I think some of the bass lines (bassoon) or intricacies in flute and clarinet or whatever can sometimes get lost in the mix, but brass was on point (trombones had their moment[s] to shine), and horns got to rip out those wonderful lines for the finale. It was a rich, exciting work, one both my guest and the entire audience could get behind a little more easily, and a way to end the evening with a bang. I am eager to see what’s coming up, but concerts like this (balancing the established classical rep with more modern, even challenging works) are more than welcome! Bravi.